The past decade has witnessed persistent claims that the American Psychological Association (APA) crafted its ethics policies in order to support the Bush Administration's use of psychologists in abusive and torturous detention and interrogation operations. The standard response from APA authorities has followed the CIA's unofficial motto: "Admit nothing. Deny everything. Make counter-accusations." That approach, however, finally changed last fall after the publication of Pay Any Price: Greed, Power, and Endless War by New York Times investigative reporter James Risen. The APA's immediate response was quite familiar: the allegations of collusion were dismissed as "largely based on innuendo and one-sided reporting." But a month later the APA Board of Directors reversed course and grudgingly hired attorney David Hoffman of the law firm Sidley Austin to conduct an internal investigation of the APA. In so doing, the APA leadership offered the assurance that Mr. Hoffman would have full authority and cooperation in conducting interviews and in obtaining "all information and documents that he believes would assist in his work." Mr. Hoffman's investigation is now underway and one focus is undoubtedly the APA's controversial 2005 Presidential Task Force on Psychological Ethics and National Security (PENS). The review of PENS that follows highlights specific issues demanding careful scrutiny by the investigative team. Credible reports began to emerge in 2004 that psychologists -- contrary to their do-no-harm ethical principles -- were involved in the mistreatment of detainees at Guantanamo Bay, CIA black sites, and elsewhere. Removal of psychologists from these roles would have undermined the rationale the Bush Administration used to authorize its brutal "enhanced interrogation techniques." As described in the infamous Office of Legal Counsel "torture memos," the involvement of psychologists as consultants to and monitors of detainee interrogations purportedly ensured that these techniques were not psychologically torturous -- and were therefore lawful. As a result, from the perspective of the White House, the CIA, and the Pentagon, it was important that the APA legitimize the ongoing participation of psychologists in detainee interrogations and related operations. And from the perspective of the APA's leadership, it was apparently a high priority to maintain the Association's cherished seat at the national security table and to nurture psychologists' lucrative ties to the "war on terror" agenda. The PENS Task Force was the APA's direct response to the reports of psychologists' involvement in the abusive and torturous treatment of detainees. 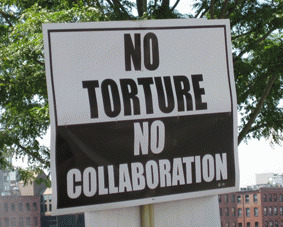 After a single weekend meeting in June 2005, the task force issued the PENS Report asserting that psychologists play a critical role in keeping interrogations and related operations safe, legal, ethical and effective. This language was drawn directly from the Pentagon's Standard Operating Procedures for its Behavioral Science Consultation Teams. By adopting this stance, the APA -- the largest association of psychologists worldwide -- became the sole major professional healthcare organization to disavow the international human rights standards that many believe should be the benchmark for professional codes of ethics.